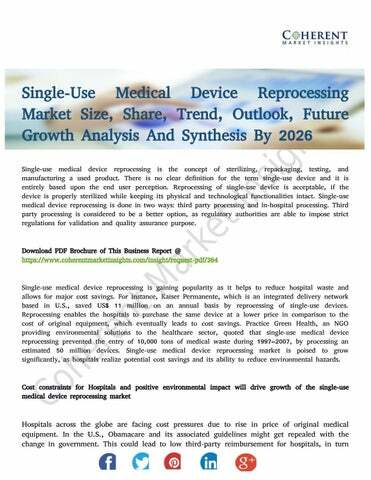 Single-Use Medical Device Reprocessing Market Size, Share, Trend, Outlook, Future Growth Analysis And Synthesis By 2026 Single-use medical device reprocessing is the concept of sterilizing, repackaging, testing, and manufacturing a used product. 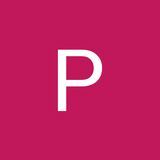 There is no clear definition for the term single-use device and it is entirely based upon the end user perception. Reprocessing of single-use device is acceptable, if the device is properly sterilized while keeping its physical and technological functionalities intact. Single-use medical device reprocessing is done in two ways: third party processing and in-hospital processing. Third party processing is considered to be a better option, as regulatory authorities are able to impose strict regulations for validation and quality assurance purpose. Single-use medical device reprocessing is gaining popularity as it helps to reduce hospital waste and allows for major cost savings. For instance, Kaiser Permanente, which is an integrated delivery network based in U.S., saved US$ 11 million on an annual basis by reprocessing of single-use devices. Reprocessing enables the hospitals to purchase the same device at a lower price in comparison to the cost of original equipment, which eventually leads to cost savings. Practice Green Health, an NGO providing environmental solutions to the healthcare sector, quoted that single-use medical device reprocessing prevented the entry of 10,000 tons of medical waste during 1997â&#x20AC;&#x201C;2007, by processing an estimated 50 million devices. Single-use medical device reprocessing market is poised to grow significantly, as hospitals realize potential cost savings and its ability to reduce environmental hazards.